Soccer aficionados are some of the most passionate and dedicated fans on the globe. So naturally, when the 2018 FIFA World Cup kicked off in Russia this past summer, scores of brands capitalized on the super fandom ignited by this significant cultural moment, from Visa’s Everywhere Lounge hospitality program to Hyundai’s team slogan competition to Vivo’s brand experience pavilions. But what about the soccer fans within the U.S.? Though the U.S. national team did not qualify for the 2018 tournament, brands created a space to court a young, digitally-savvy, diverse audience with viewing parties, athlete appearances, influencers within the soccer scene and even a FIFA esports tournament. Here’s how Budweiser, adidas and Wells Fargo activated for U.S. soccer fans this year. The Robokeeper kept soccer fans active and in a competitive mood during the event. As the global beer sponsor of the FIFA World Cup, Budweiser wanted to celebrate with soccer fans in its own backyard, engaging in the process craft beer-obsessed millennials who might never have tried a Bud (gasp!). 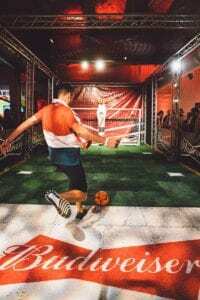 The result was a 750-person Budweiser LIVE World Cup final viewing event in New York City that featured soccer influencers and athletes, local art, gear customized by a fashion icon, international music talent and kegs and eggs. “It was a great fit because there’s a great soccer watching culture here, whether that’s from internationals moving to New York, carrying their traditions and their fandom with them, or just the new fans. There’s definitely an uprising in American culture in terms of people that are becoming soccer fans,” says Nick Burt, manager-experiential marketing at Anheuser-Busch. With the match starting at 11 a.m., Budweiser opened the doors at 8 a.m. After all, kegs and eggs is not a rare experience for soccer fans. For many, it happens every weekend while fans watch leagues like the English Premier League, which, thanks to the time difference between the U.S. and the UK, airs games as early as 7 a.m. eastern time. For attendees who didn’t want eggs for breakfast, food trucks provided options for purchase (Mosaic, New York City, and DS Projects, New York City, handled). Touchpoints included the FIFA gaming lounge, where attendees could play FIFA 2018 on PlayStation 4 units, as well as LED-illuminated foosball, a GIF booth featuring Budweiser’s Man of the Match trophy, mural art by local artists, and a Budweiser LIVE soccer jersey customization station with embroidered patches and an inkjet gun. Local soccer influencers and soccer freestylers performing stunts were also in attendance, and the “Men in Blazers” of NBC Sports provided pre-match, halftime and post-game analysis. In addition, there was the notoriously difficult Robokeeper game, often used in soccer activations and even more often, unbeatable. To add international flavor, Budweiser brought in English pop artist Charli XCX as the musical artist. Meanwhile, New York City icon DJ Parler created a 30-second track to drop when a goal was scored, modeled after announcer Andrés Cantor’s famous “GOOOAAALLLL!” but with added trap music in the background. “After going to this event, someone who may not have had a Budweiser either in their life or the last six months will go to the store and be like, you know what, I’m going to watch the EPL Saturday morning. I remember how great a time I had watching the World Cup with a Budweiser in hand,” says Burt. Cheers to that. 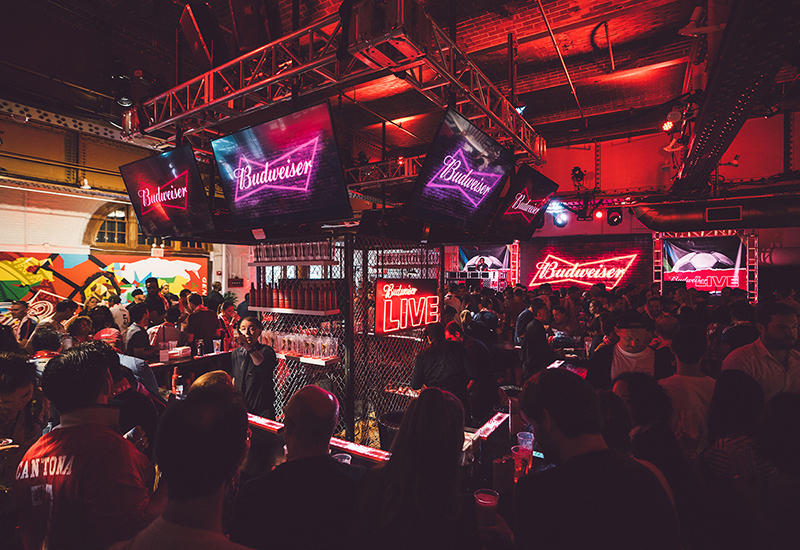 Budweiser took kegs and eggs to another level with its live-streamed World Cup viewing event. 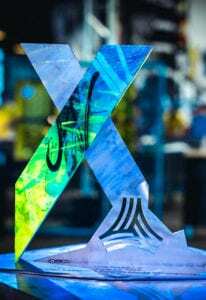 Graffiti artist Saber helped craft a sculpture that served as a trophy for the winning team. Adidas was busy this summer expanding U.S. soccer fans’ cultural knowledge of the sport by introducing them to the concept of “street soccer” or “futsal,” which is more popular in Europe and across the globe. 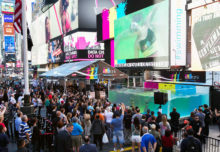 At the start of World Cup fever, the brand staged one of several street soccer experiences as part of its global Tango League competition series. Held in June in Los Angeles at the indoor UrbanFutsal facility, The Base, the event coincided with the launch of the adidas Energy Mode X18 boot and also fueled the brand’s U.S. soccer narrative for the year (Match Marketing Group, Boulder, CO, handles). Different from the 11-a-side play format that U.S. soccer fans are accustomed to, 5-a-side street-style soccer is more focused on creativity in the game. 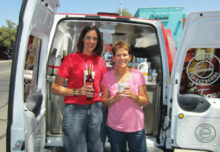 Players in the Tango League are duly rewarded for demonstrating as much. Players for each event (ages 16-35 can qualify) are chosen on social media, from adidas brand channels and soccer influencer channels, via a call to action to sign up. Players can also apply using the Tango League app. 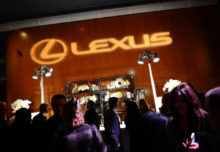 The brand then selects the teams that will be invited to the events, but the teams that don’t make the cut are still invited to be spectators and engage with the brand on-site. Aside from helping to choose Tango League players, influencers serve as guest judges by picking an MVP after each match as well as the overall MVP of the tournament, who then becomes an adidas representative, gaining access to products and special experiences such as box seats to NFL games and meet-and-greets with adidas athletes. The MVPs of individual tournaments are also invited to represent their cities in one of Tango League’s global events. And finally, MVPs can be named to a small group of the elite Tango League players, Tango Squad FC, who travel the world to train and play against, and with, some of adidas’ biggest teams and assets, such as Manchester United and Bayern Munich. 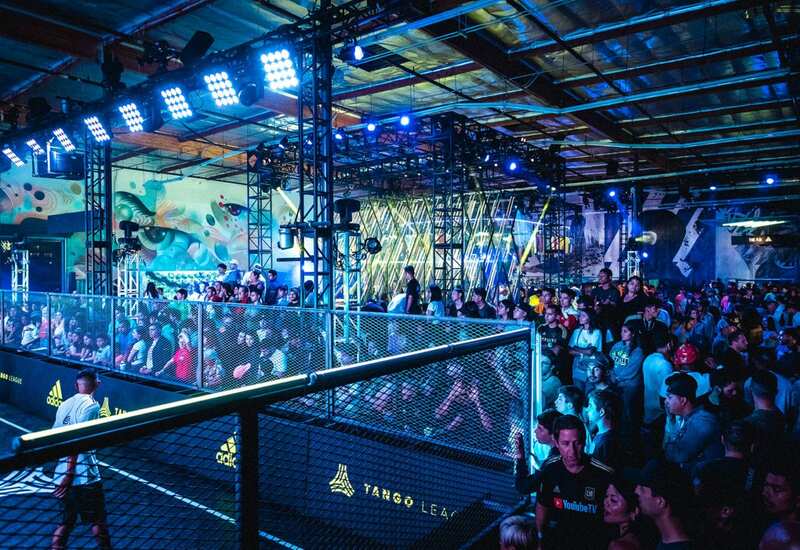 The L.A. event offered touchpoints like a retail pop-up shop from L.A.-based Niky’s Sports, a jersey customization lab, and a live-painting of a wall of soccer balls by L.A. graffiti artist Saber (the balls were then offered to top players, influencers, VIP, media and a few fans to take home). There was also a Marcelo Vieira augmented reality experience, where fans were challenged to demonstrate their freestyle skills and be judged by Marcelo (a player for Madrid) whose likeness appeared on a large, interactive screen. The event wrapped with a performance post-tournament from rapper Rich the Kid. 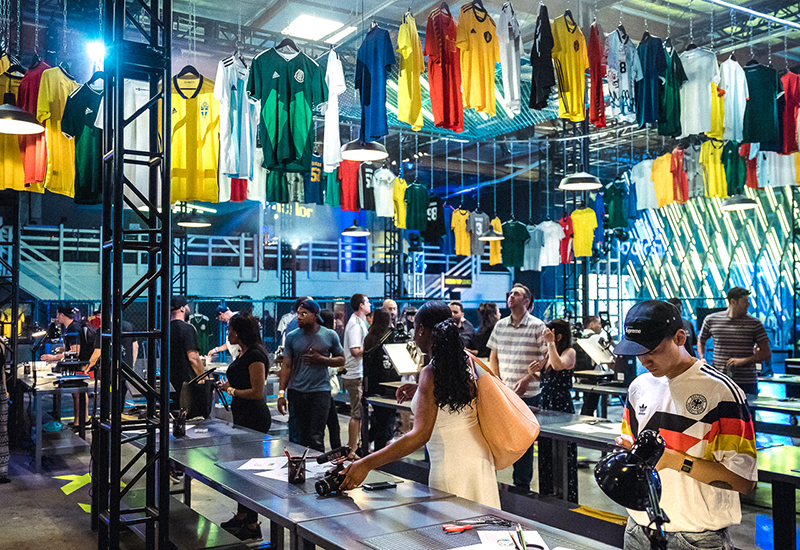 Adidas is engaging soccer fans in the U.S. by immersing them in global styles. Wells Fargo’s partnership with MLS this year included a new eMLS esports event featuring professional FIFA players. You can’t talk about soccer fans in the U.S. without mentioning North America’s professional league, Major League Soccer. According to league research, the MLS fan base is young, diverse and digitally savvy. “Thirty-four percent of our fans are Hispanic, the highest concentration of all major sports leagues, and we know that our fans are all digitally connected,” says Adrienne Barber, vp-partnership marketing at MLS. Access to a younger, diverse demographic motivated Wells Fargo to partner with MLS for the past five years, and for the past three, the brand has sponsored MLS’s Digital HQ, an interactive content hub open to the public that hosts all the league’s digital and social media content and showcases its focus on innovation. The space features an adidas pop-up shop, a “Tweet to Win” vending machine, a gaming lounge and a Wells Fargo-branded studio space for producing MLS content. Given the large percentage of Hispanic soccer fans in the U.S., Wells Fargo also sponsors the Mexican national team as part of its fan outreach. During the World Cup, the brand hosted viewing parties when the team played, and it also throws viewing parties throughout the year when Mexico plays in the U.S.
“It’s really important to connect with them in-market,” Toussaint says. The Mexican national team often hosts a fan zone for a few hours before the match that becomes a family affair. 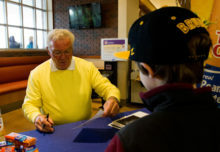 “We usually bring a soccer legend so that fans can have that one-on-one interaction, take their photo and get the autograph. We get players who love kids and they’re literally kissing babies,” she says. Back to MLS: Wells Fargo’s partnership with the league recently extended to live event activations. This past year, MLS introduced a new esports event, the eMLS All-Star Challenge, which took place at the Digital HQ Aug. 1 in partnership with the EA Sports FIFA franchise. 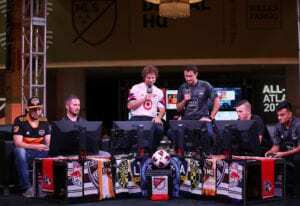 The tournament, for which Wells Fargo was a presenting sponsor, featured 16 players, eight of whom were eMLS professional FIFA players, competing in teams of two with former MLS players, celebrity guests and streaming personalities. The event was streamed to YouTube, Facebook and Twitch, which had 50,000 concurrent viewers at its peak. “It was a natural extension into a new type of activation for us that still connected Wells Fargo to soccer in a really cool, interesting way,” says Toussaint. “We see esports as an interesting new area of the sports industry, a different way to use soccer to reach a younger audience.” Talk about goals.